Ammonia when mixed with Bleach gives out Chloramine Vapor – Toxic chloramine vapors are formed when the most ordinary domestic cleaners, bleach and ammonia are mixed. Chloramine vapors might create hydrazine which is poisonous in nature. It causes the eyes and the respiratory system to burn and can cause organ damage. Hydrazine will be produced if the amount of ammonia is enough. Hydrazine is toxic and also has an explosive property. Not only discomfort but even death may be caused due to them. Rubbing Alcohol when mixed with Bleach gives out Toxic Chloroform – Chloroform is produced when the rubbing alcohol that contains isopropanol or ethanol has a reaction with bleach that contains sodium hypochlorite. Hydrochloric acid, dichloroacetone, and chloroacetone are some of the other horrible compounds that may be created. Breathing it in will knock anyone out and too much exposure can result in death. The HCl produced can cause chemical burns. These chemicals can also cause diseases such as cancer and organ damage. Vinegar when mixed with Bleach gives out Chlorine gas – Other cleaners should not be mixed with Bleach (as it is highly reactive) and our previous examples have shown that. The reaction between bleach and vinegar results in the production of chlorine gas. Chlorine was used in chemical warfare and thus is something which should not be inhaled. Our respiratory system, mucous membrane and the skin have a violent reaction to this chemical. High concentrations of this chemical can kill someone and small quantities will give one a cough, chemical burn or an irritation in the mouth, nose and eyes. Peroxide when mixed with Vinegar gives out Paracetic Acid – Sometimes people turn the switches of their brain off and decide to mix two cleaning products we can be dangerous for Monsieur Chemist. Paracetic acid is created when hydrogen peroxide reacts with vinegar. The disinfecting properties of this chemical is better but it’s also corrosive. The effects of it are irritation to the eyes and mose and might also give a chemical burn. Vinegar when mixed with Baking Soda gives out water – This reaction will not produce a toxic resultant but an ineffective one. Children who make chemical volcano’s for their projects use this reaction to create carbon dioxide sodium acetate and water. These are some of the chemicals that can be found in all our households that should never be mixed together. 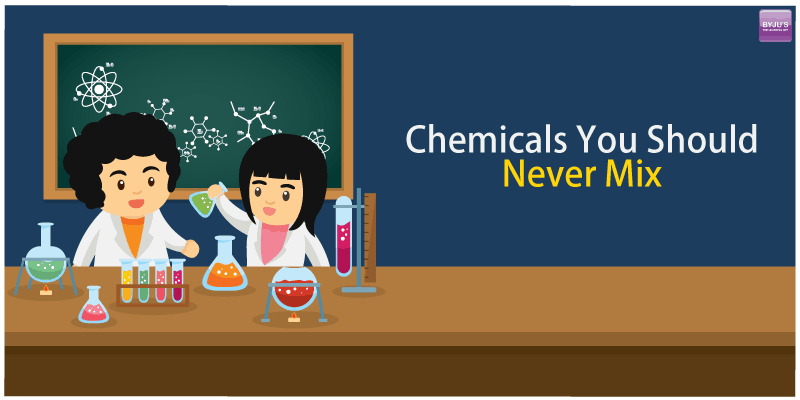 To learn more about chemistry and chemicals that do and don’t go well together visit us at byjus.com or download our Byju’s – The Learning App.